The British FV4018 Centurion BARV (Beach Armoured Recovery Vehicle) was is a British military support vehicle used for amphibious landings. There have been three different BARVs in British service since their introduction during World War II. They were also used by Dutch and Australian forces. The Centurion BARV FV4018 was the replacement for the Sherman. Twelve were originally built for use by the Royal Marines. It had a crew of four; two of the crew were members of the Royal Engineers, one of whom was a qualified diver. The Centurion BARV’s were built to provide the essential role for the LPD’s HMS Fearless & HMS Intrepid as part of the Beach Assault Squadrons. The Centurion BARV was basically a Centurion body with built up sides to accommodate wading in water up to 11 feet. 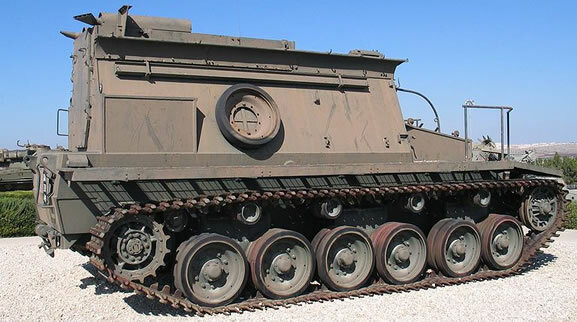 The design was functional yet crude with sloped armour built above the tank hull. The tracks for the BARV were reversed so they had better grip biting in reverse. The Centurion tank used the Rolls-Royce Meteor engine. There were many occasions when the BARV would break down or get stuck. In 1981 the BARV from Fearless was to be lost at sea off Browndown beach to end up fully submerged. The following year both BARVS would see service during the Falklands War, being the largest land vehicles ashore, with the BARV from Fearless breaking its drive chain whilst working Blue Beach.